This is my first experience with a Nikki McClure book. I was impressed with the artwork used and think it was effective in drawing the eye toward what the author wants you to notice. It is a bit lengthy non-fictional read packed with plenty of information on different products you can buy at a farmer's market. I appreciate the explanations of how an item got to the market ready for purchase.This book did make me want to get back out to the farmer's market when the weather permits around here! I live in Washington, so it was a special treat to read a book by a Washington author. McClure goes to a farmer's market in state capital, Olympia. It is about an hour from where I live. I may have to go one day just for the blueberry turnovers! Ok, first of all, everything Nikki McClure does is so beautiful. I can't help but check out anything I see of hers. This books is very interesting for preschoolers (and older) who are curious about how things work and where food comes from. My 3 year old is often asking questions about such things, and this book explains it: when you see the guy selling eggs at the market, this is the kind of work he does to get them there. I personally like how this book also shows a modern view of farmers--they aren't all stereotypical overall-and-straw-hat-wearing, weathered-looking, old men! Quick! Where does food like fruits, vegetables, meat, eggs, and cheese come from? Of course, silly, from the grocery store. Well, not always, and there’s more to it than just that. More and more people are turning to local farmers markets to find fresher and healthier foods. In this book, a young boy and his mother go on Market Day to shop for Michael’s crisp apples, Colin and Genine’s kale, Steve’s smoked salmon, Benjamin’s maple honey, Evan and Emma’s blueberry turnovers, Heather and Katelyn’s goat cheese, and even Yukie’s hand-dyed napkins. What will they do with all this good stuff? Author Nikki McClure, whose cut-paper art nicely illustrates the story, visits the Olympia, WA, Farmers Market every week. All of the people pictured in the book are real vendors at her local market. In addition, McClure did extensive research on who makes the food she eats and how it gets to market. So as the boy and his mother shop, they tell the reader how each item is grown or made so that it can grace their table and fill their stomachs. Did you know that there are over 6,000 farmers markets in the United States alone? To Market, To Market will encourage people to buy locally, eat healthy, and discover new foods. It is a unique and fascinating way to introduce youngsters to how food is grown, prepared, and brought to market. Perhaps the “way it used to be” is the wave of the future. 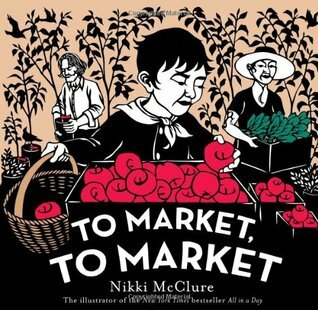 Nikki McClure’s most recent cut-paper picturebook tells the story of a bustling farmer’s market. Her celebrated images catch the eye of children and adults alike as the story follows a young boy and his mother shopping for goods. To Market, To Market will resonate strongly with today’s children and families, particularly those who have experienced the vibrant environment of a farmer’s market before. The story shares information about how each item is grown or made, introduces the farmers and artisans behind each product, and culminates in a fabulous feast. Almost every open contains a new heading to showcase a segment on a particular food item. The corresponding picture facilitates the sharing of memories, provides examples for recall, and catches the eye through the intense contrast of large, solid colors layered together. I recommend this book to those wishing to bond with their children over the common experience of a market day, or to those who want to teach about healthy specialty foods, or to those who just want to watch their child marvel over the illustrations. Originally published at: http://apatchworkofbooks.blogspot.com...To Market, to Market by Nikki McClure (also the illustrator of the beautiful All in a Day) has created a beautiful and educational story with a nice story included as well. Focusing on the wonders of a farmers market, the pages switch between a story about a family going to visit the market and facts about how different fruits and vegetables end up at the market. We learn about kale, apples, honey, cheese, and even napkins!The text is paired with beautiful illustrations that are totally unique to this illustrator. I've never seen anything like them before and I've loved staring at all the books McClure has been a part of!This one would make a really nice book for those wanting to introduce their kids to how great farmers markets are and how we really should be thanking the farmers for providing us with such wonderful produce and other products. Have you ever wondered how goat cheese is made or how beekeepers extract honey? Readers follow a mother and son through the market as they stop at each vendor to pick up the items on their shopping list (from the title page). Intricate cut paper illustrations detail the wonders and the artisans of the farmer’s market capturing every feature, from scraggly beards and tattoos to a mother reminding her son to use good manners. The simplicity of the black and white color scheme paired with a single color serve to highlight the red apples, green kale, and deep indigo cloth, while illustrating the elaborate facets of the cut paper designs. Paying homage to the vendors’ skills and knowledge, McClure’s celebration of the farmer’s market is sure to nourish the minds of readers of all ages. I love Nikki McClure's illustrations! This book is a love-letter to farmers' markets and the wonderful items they bring us. The reading level is a little difficult to determine. The first few pages, and the intro to each "chapter" read like a traditional picture book. Each "chapter" (contained on one page) goes into detail about a certain vendor - the apple-seller, an indigo dyer, the bakers, etc. These are on a much more difficult level, probably about third grade. It would make a good book to read aloud to a second-grade class or in tandem with a child who is enthusiastic about visiting the market.I do love the repeated refrain of "thank you (person, animal, etc) for (yummy food, useful item)". This book is a lovely reminder to be grateful for the local harvest we enjoy. Cut-paper illustrations with digitally added color are the stars here as a boy and his mother visit the community market and purchase apples, kale, salmon, honey, blueberry turnovers, cheese, and even napkins for a feast they'll have at home later. Detailed descriptions of the farmers and craftsmen and women and the work they must do before bringing anything to the market is provided, ending with a thank you to each one. The tidbits provided are intriguing and will educate readers who often take what they consume for granted; for instance, I had no idea that indigo relies on bacteria whose consumption of the dried indigo plant releases the blue color into water. Each one of these stories about the folks at the market is fascinating. What a well written book. The illustrations are cut from black paper placed on white paper. If the illustrator/author makes a mistake she doesn't stop she keeps going and works the mistake into her art. The contrasting colors are perfect for baby eyes. The book is about the work the vendors from the farmers market do to bring their goods to the market. Well researched, well thought out, and thoroughly enjoyable. My then five month old, now six month old is completely fascinated each time I read this to him. My six month old also fell asleep as I read him this review while writing after we read the book. Like most Nikki McClure books it has beautiful artwork and a thoughtful approach to a story. In this case - McClure takes us on an adventure through a farmer's market and highlights the people that one may encounter. Then she highlights the process that those poeple take to make the product that that they sell in the market. My 3 year-old loved it, and I found it interesting enough to not get bored the first couple read-throughs. If you've never been to a farmer's market or are not into slow foods, then you and your kids may not enjoy this book. Nikki McClure - Nikki McClure of Olympia, Washington is known for her painstakingly intricate and beautiful paper cuts. Armed with an X-acto knife, she cuts out her images from a single sheet of paper and creates a bold language that translates the complex poetry of motherhood, nature, and activism into a simple and endearing picture. Nikki McClure is a self-taught artist who has been making paper-cuts since 1996. As one of the more prominent visual artists involved with Olympia-based record labels K and Kill Rock Stars, as well as the Riot Grrrl movement in the early nineties, her work still embodies the fiercely independent fire that fueled the passion and creativity of that time period. She lives in Olympia, Washington.